« Day Thirty – Challenge Complete! Last night a woman who I like and respect quite a bit posted a rather lengthy Facebook status. Tammy and I met several years ago at the farmers market where I’m a vendor and she is a regular customer. Her status bothered me so much that it’s now 3:00 AM, about 5 hours after I read the post, and I’ve given up trying to sleep, gotten out of bed, and am at the computer in our farm office, trying to regurgitate the thoughts I’ve had since the initial read. She’s a mom of two, and is making all of the food choices for her family. Her post centered around her feelings of being torn between “seemingly opposing sides” of the “local, heirloom, organic, grass-fed, humanely raised, sustainable, non-GMO, antibiotic-free, free-range” farmers and those who farm using conventional methods. I’ve left the comfort of my warm bed to try to explain that, Tammy, you don’t have to choose a side. The recent round of fear-based marketing, most prominently displayed by Chipotle’s new advertising campaign introduced this week, will have you believe that there is only one correct choice and that it must be the one with the most adjectives attached. I’m troubled by the increasing prevalence of emotionally charged fear mongering in food marketing and am especially bothered by how it’s affecting people like Tammy. It’s beyond annoying to me when one method of production is misrepresented and put down to make another look good. This tactic is being used not only by major food retailers like the burrito purveyor, but by farmers against one another. It is this particular practice that makes me saddest, as the rift is non-productive and dangerous. I would suggest that there is room for all types of production methods in today’s agriculture and that they can peacefully co-exist. The reality is that there are plenty of markets for farmers today. Consumers have a variety of desires and demands, from budget to niche related. We also can’t overlook the fact that we’re facing a very real global population explosion and it will take all farmers, large and small, organic and conventional, doing what they do best, to feed it. A farmer makes the decision on what kind of crop to grow and how to grow it based on a multitude of factors, which include location, facilities, resources, market opportunities, availability of labor, personal preference, etc. I’ll give some examples beginning with my own farm. Here we have a herd of 60 beef cows. It’s that size because of the amount of land, and the quality of land, that we have available. The land where my cattle graze during the spring, summer and fall has been in my husband’s family since the 1840’s. Because of the soil type and terrain (gravel in some spots, too wet in others) it’s not really suitable for growing a crop but makes a great pasture. That reason, coupled with the fact that both my husband and I enjoy working with cattle, is the reason that we raise beef, and are the size that we are. If there was more of the same type of land available we might choose to increase our herd size, but would have to consider other factors such as the need to hire more help to care for the additional animals. Sixty cows is the size that works for us. The decision about how to market our beef, which is directly to consumers, was made based on the fact that here in McHenry County we’re physically located in a fairly populous and prosperous area between two major population centers, Chicago and Rockford. Because of that proximity we can market our products direct, or choose to sell through traditional markets. I have friends who raise cattle in North Dakota. They’re in a remote rural area literally 100 miles from the nearest Starbucks and 80 miles from a McDonalds. Marketing direct to consumers is not an option for them simply because the population is not there to draw from, the market simply doesn’t exist for them. They also have about ten times the number of cows that I have. They are that size because they have more land and more labor available; there are actually 3 generations of their family working together. That’s the size that works for them. It’s not better or worse than what we’re doing here. I choose to not use growth promotants in my beef. It’s because my customers tell me that they want it that way. As a consequence of that choice, my cattle grow a little slower than cattle from herds where they are used, so mine will require more feed. The cost of that feed is passed along to the consumer, thus my beef is more expensive than the more efficiently raised alternative. I’m very aware that there are people who can’t afford my beef. That’s OK and I’m happy that there is more affordable beef in large retail stores available to them since I believe that beef is a terrific source of necessary protein (not to mention iron and zinc), and it’s great tasting, too! I would never suggest that there’s anything wrong with the less expensive beef that is raised in a different manner. Growth promotants have been used for decades and are completely safe. I personally would not hesitate to buy beef from the grocery store if I did not have my own home-grown supply. Similarly, I do not have a problem feeding my own beef to my family or selling it to others even though it does not carry the “organic” certification. 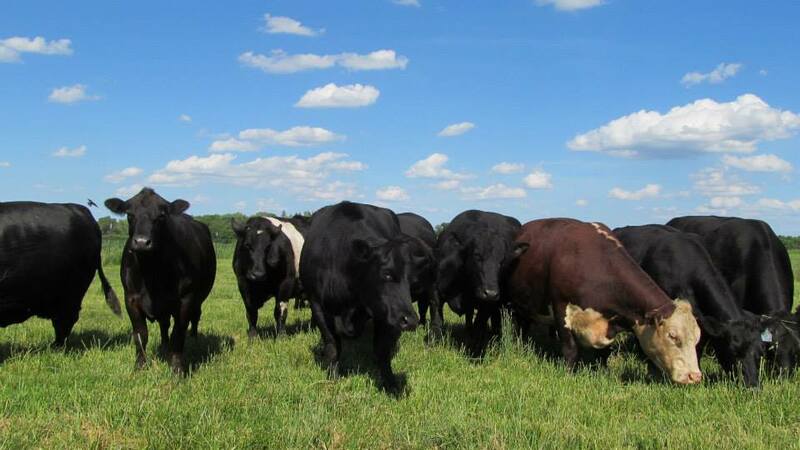 The bottom line is that I have found a market for my beef, while other farmers have a market for less expensive, efficiently-raised beef, and yet another group finds buyers who are willing to pay extra for the organic label. We find what works best for our own farms. I also market my beef as “natural”. This term on a label means (by USDA definition) that it’s minimally processed with no artificial additives. There are no preservatives or food coloring in my beef. Again, I’m not suggesting that there is anything wrong with either of these, just going along with the preferences of my customers. In fact, the absence or presence of a growth promotant, a preservative, or food coloring has absolutely no effect on the nutritional value, taste, or safety of beef. And remember that all beef, regardless of the number of adjectives used to describe it, must always be handled and cooked properly. A person can become ill from improperly prepared food, whether it’s organic, sustainable, free-range or not. Getting back to the customer…I’m able to fit my production methods to the demands of my clientele. These days, they tell me that “local” and “natural” are important to them, they don’t have strong feelings one way or the other about “organic”. They do like know that the money they’re spending is staying in the county. They want to have a relationship with their farmer and know how and where their food is raised. I’m happy to comply. If things change and price, or something else, should become the priority, I will have to adapt my production methods accordingly. I have neighbors who grow vegetables. Their farm is located on a state highway, perfect for a farm stand, given the amount of traffic in our suburban county. They can market a large amount of a wide variety of their vegetables directly to consumers right from home. I have other friends who also grow vegetables but their farm is off the beaten path, actually on a gravel road. A farm stand at home is not an option for them (they like their quiet location, and admit that they would not enjoy hosting the public at their home on a daily basis as others do), so they’ve chosen to load a truck several times a week during the growing season and sell at farmers markets, or sell to the wholesale market in Chicago. Another friend from the farmers market has a very small amount of acreage and grows heirloom (and other varieties of veggies that you don’t see everywhere) using organic methods. She chooses this because it’s what her customers want; the “organic” label is important to them and they are willing to pay for it. She’s able to comply because her small scale is manageable for her without much extra help. Her veggies do cost more due to the cost of organic certification and market expenses, but she’s found a niche for herself and gets a premium for her products. The neighbors with the farm stand have a large amount of land with fertile soil types. They choose to raise their veggies using conventional methods and fairly large equipment. They don’t believe there’s anything wrong with organic, but their choice is based on the fact that organic production requires more labor which is not readily available to them, and more importantly, their customers are happy with the variety, quality, and quantity of what they produce. It’s the size and method that works for them. Each has chosen what works best, not necessarily “a side”. So for Tammy, and other consumers who are struggling with food choices amidst overwhelming labels, adjectives, and headline-grabbing, myth-based marketing campaigns, I say pick whatever works best for YOU. Don’t be mislead by fear-mongers and unjustified guilt. Ask questions of those who are actually growing the food, and discount the opinions of those who must tear down someone else’s choice to make theirs look most appealing. Buy what you want given your own budget and preferences. And remember that it doesn’t have to be all or nothing; there is no rule against buying conventional one day and organic the next. Whether you’re buying food for your family at a small farm stand, the local farmers market, Jewel, Trader Joe’s, Target, or Costco – with no adjectives or a list of adjectives as long as your arm – know that there’s a farmer at the other end who made choices too. There’s no wrong answer. Okay, glad I’ve gotten that off my chest. The day is now beginning, time to start my day the same way farmers and ranchers all across the country do, regardless of the number of acres they own, animals in their care, or method of production they’ve chosen for their farm. We’re all getting up and checking our animals; making sure they’re comfortable and secure, that they have plenty of feed, water, and a dry place to rest. Our livestock comes first no matter the adjectives attached to the label. No choice there. Well said and explained. Thank you for giving up some sleep to share your voice of reason. great post. everyone should read this. best to you and your herd. All sounds good, but how much is true. Where is the proof that beef raised “efficiently” with growth enhancers, is as safe as that raised without, or that grain fed and or finished beef isn’t slowly killing us. Would that this post was all true but something is killing us and a lot of the evidence points to our food. Way more questions than answers, and justifying everyone, is not the answer. Thanks for your comment, Brian! My post was simply a response to a social media conversation, not intended to present scientific information one way or another. Good idea for a future post, though. Great way of explaining all the choices and the reasons for them. Finally! Someone so eloquently is saying what I have been thinking all along! Great post, very well written! I have been encountering many of these same thoughts and discussions lately as I talk with people both inside and outside of the farming community. This somewhat clears up the issues but I find your mentions of what you and your friends doing natural organic no hormones confusing. Do you have friends doing the contrary what is more specific about how it affects the product compared to yours. What about Gmo crops? What about those? Opinions and facts. I want to hear from the source. Thanks for your comment, James! Yes, I have friends who raise cattle using a variety of methods. Some choose to grow GM crops, or feed GM products, other do not. Again, a personal choice based on a number of factors. This was very well written! Thank you for sharing and putting it so well! The U.S. has an extremely safe food supply because farmers/producers of all sizes work hard everyday to ensure that! Thank you again! Thanks, Anne! I appreciate your comments. Thanks, too, for all you do to advocate. I do not often “reblog” other people’s writings, but this one is too good to pass up. We are blessed to have a diverse and plentiful supply of food — let’s make the decision to be thankful for food choices and respect all types of agriculture. Thank you Willow Lea Stock Farm! All types of agriculture provides all types of food choices. Love it! I too have lost sleep based on the social media posts of my non-farming friends. I wish there was something we could do to stop the ever increasing fear mongering and false marketing that seems to be taking over. Getting up early, turning on the computer and fighting the battle of words is about the best we can do! Thanks for your comment, Angela! Agreed! Yep. Know your farmer, understand your food, and make the choice that works for you and your family. I would just like to see more places have that choice. Not everywhere does. Although that seems to be changing little by little. As a veterinarian and professor of animal science, I wish more farmers could express themselves as well as you do! Thank you. So many people are misled by the “hype” about organic and forget it is a choice and not one everyone can make. I am also in an area where organic is easily available and most have the money to make that choice and those that do often criticize those that don’t. But the expense is such that many can’t and the food supply is very safe here in his country regardless of production type. Convincing folks of that against false advertising hurts all farmers in the end. I appreciate your comments, Doctor! Thank you! This post has summed up every thought that I’ve had for a very long time. I work on a 200 cow beef operation and 150 head dairy farm and i’m also a member of my local FFA chapter and its hard for me to find a way to say to people that there isn’t a right or wrong way to farming. Thank you for putting it in a way that most people can see that. I would love to use your post in a research article I’m writing about using more than one method of farming to feed the growing population? Thanks, Thomas! Feel free to use the post in your article. Very succinctly written. I am one of those shoppers who likes the additional adjectives behind, in front and around my food and what I buy for my family. There are many indicators that the poisons used to kill bugs and weeds on and in our food are killing us as well. The increase in illnesses and diseases is growing at a rate faster than the population itself is growing. I buy from local farmers when possible, it is important to me to support local, healthy, sustainable methods of producing food, I grow my own organic vegetables and buy organic and non-GMO products at the local grocer in support of healthy food. Yes, it is expensive, I hope by continuing this path it will support growth that will bring down prices for others who can’t afford it. For us, it does feel like a food fight. We want to trust what the government tells us, then find that they knew for years that something was bad for consumption but made concessions to the businesses producing it in the name of profit. Why does the FDA believe that a product is ok if it only sickens or kills one in a thousand or so? Why does the USDA shut down the small organic business but allows that mega business to leave bad food on the grocer shelves? The topics are many and convoluted. To think bigger picture and not just the next meal is important on many levels. We need farmers who care about their livestock and what they feed them, farmers who care about the land, how they grow crops, what they put in their own children’s mouths and the mouths of other children. WE SUPPORT YOU!!! 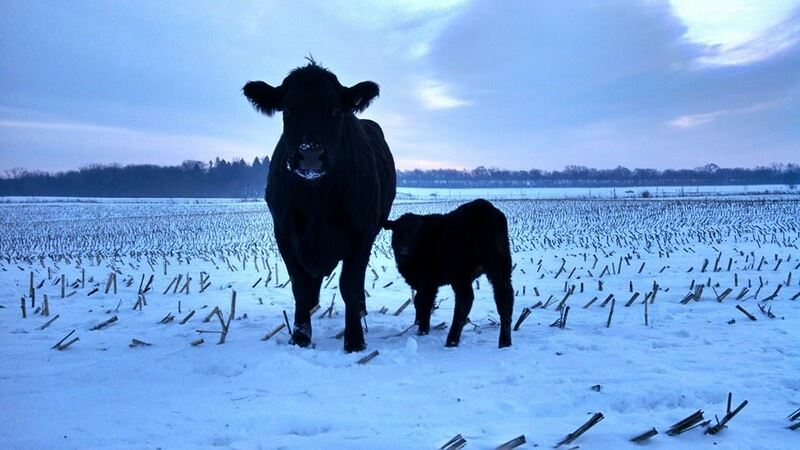 We appreciate the care you take with your livestock, crops and land, don’t let any one tell you different! I know your thoughts written down during the early hours in the morning are the heartfelt feelings of what you and your family strive to do, how you approach raising healthy animals and how you look at decisions made by others. Please know, we are not swayed by marketing, we have researched, read articles, talked with doctors and are distressed by what we have found. We will continue our chosen path in support of better food and health. I and mine are but one household, but we are in good company! Thank you for your thoughtful comments, Marie. I, too, would like to compliment you on the excellent way you have emphasized choice over right/wrong. We use growth hormones, antibiotics and GMO’s. We raised five healthy and successful children that grew up eating it. I would love to steer the discussion about food towards smaller portions and less sugar. With food waste estimated at 40% there’s another issue to address that each one of us can do something about! Thank you! Thanks for reading and commenting, Joan! You’ve raised some great points! As a consumer, thank you for explaining your point of view. But I will never ever agree to any “farmer” who believes in factory farming. Animals should not be treated like they don’t have any feelings. I understand they are bred to be food but at least while they are alive give them a decent quality of life and slaughter them humanely. Some of the things I read about how animals are treated makes me want to become a strict vegetarian!! How very sad!!!! Hello my dear consumer. I am one of those labeled as a factory farmer. I would LOVE to bring you to our farm to show you our feedlot and how we take care of our animals. Could you compare your judgement of farmers to that of saying all parents are bad because of those that do horrible things to their children? Please give us a chance to open our doors so that you may take a look inside! Thank you for caring enough to engage in the conversation!! Thank you for stopping by COUNTRY LINKed! It gave me the opportunity to visit your blog and read this post. Very well written!! Food is a choice and everyone should be able to make the choice that is best for them. Well written. I love your “voice” (as they say in writing circles); it is patient, thoughtful and very approachable. It is pitch perfect in laying out the decisions you made and why others may not make the same choices. My lone (tiny–no, no really–insignificant) quibble is the ‘population explosion.’ True the world’s population will grow for a bit, until around the 2050s (at 9billion) and then start to decline.